Significant questions have surfaced about not only the father of Texas Republican senator and presidential contender Ted Cruz, Rafael B. Cruz, Sr., but now also the senator's Cuban grandparents, Rafael and Emilia Cruz. WMR has been at the forefront of asking questions about the Cruz family from Cuba and our recent report about a male bearing a striking resemblance to Rafael Cruz, Sr. appearing handing out "Fair Play for Cuba" pamphlets at the International Trade Mart in New Orleans in August 16, 1963, has generated a firestorm of comments on the web. In 1957, Rafael Bienvenidos Cruz, the son of an employee of the U.S. intelligence-linked RCA Corporation with the same name, Rafael Bienvenidos Cruz, left Cuba for the United States. Cruz claims he fought with Castro against the fascist government of Fulgencio Batista but soured on the revolution. However, Cruz left Cuba two years before the Castro revolution and there is no solid evidence that Cruz fought with Castro's forces. However, in from the early days of the Cuban revolution in the early 1950s to the time before Castro took power, some in the CIA supported Castro against Batista while the United States officially backed the Batista regime. One of these was Bob Chapman, the CIA station chief in Santiago in eastern Cuba where the Castro forces were strongest. He and his predecessor, Bill Patterson, allegedly steered covert U.S. aid to Castro against the wishes and without the knowledge of Earl Smith, the pro-Batista U.S. ambassador in Havana. In any event, Ted Cruz's father's story about supporting Castro against Batista could have been told by any CIA agent operating in eastern Cuba at the time. RCA, which employed Rafael B. Cruz, Sr.'s father, was a major player in CIA operations throughout the world, and especially in Latin America, where it helped install CIA clandestine radio stations and operated signals intelligence bases for the U.S. National Security Agency. RCA's chairman and CEO, General David Sarnoff, was involved in a number of anti-Communist fronts linked to the CIA. Sarnoff also directed his NBC network to help train CIA agents in developing anti-Communist propaganda. The grandfather Cruz's links to RCA may have helped him and his wife obtain visas to enter the United States in 1966. Sarnoff supported supplying anti-Communist guerrilla forces behind the lines in the Baltic States, China, Poland, Hungary, Albania and "other areas" with clandestine radios and other equipment. Cruz arrived in Austin where he enrolled in the University of Texas. This is a strange story since he claimed he left Cuba with only $100, which he said was sewn into his underwear. Cruz eventually gained U.S. permanent residency and a degree in mathematics from the University of Texas. In 1959, Cruz married Julia Ann Garza on January 1, 1959, and, after Cruz graduated from the University of Texas in 1961, the couple moved to New Orleans from Dallas after the birth of their second daughter on November 18, 1962. Cruz, Sr. maintains that he moved to New Orleans from Dallas after his divorce from Julia. However, a 1967 New Orleans phone book listing for Cruz, Sr. lists him and Julia living in the same residence in New Orleans. Cruz is listed with the profession of "geophysical computer" technician and residence of H201 French Street. It is but one of several anomalies in the official Cruz biography. The FBI analyzed the news footage of accused John F. Kennedy assassin Lee Harvey Oswald passing out pro-Castro pamphlets on August 16, 1963. The photo of a group of supposed pro-Castro activists was taken on August 16, 1963 in front of Clay Shaw's International Trade Mart in New Orleans. An FBI New Orleans memo dated November 26, 1963, states that WDSU photographer Johann Rush did identify Oswald and spoke to him. Rush said he could not identify "Mr. X," the man standing behind Oswald to his left as one Barry Baguglia. The Baguglia name arose with U.S. Secret Service agent John Rice who said WDSU TV news people told him that Mr. X might be one Barry Baguglia. Rush denied he mentioned Baguglia and that he never heard of him. WDSU's John Corporon, Jim Mitchie, Bill Slatter, and Mike Lala told the FBI they never heard of a Barry Baguglia. It turns out that the Secret Service's Special Agent Garretts was the one who passed on the name Baguglia. Garretts claimed he received the Baguglia name from Herman Kohlman, Assistant District Attorney for Orleans parish. Kohlman later told the FBI that he never mentioned the name Baguglia to Garretts. What Kohlman told Garretts was that his Orleans detectives had arrested Alvin Roland Beauboeuf at David Ferrie's apartment and that Garretts may have confused the name Beauboeuf with Baguglia. The FBI concluded that the man present with Oswald wearing a white shirt and narrow tie was not Baguglia: ". . . it does not appear that there is any basis for the comment made by RICE that one of the five or six people handing out literature in front of the International Trade Mart was a person who might be BARRY BAGUGLIA." The individual who bears a resemblance to Rafael B. Cruz, Sr. was never identified by the FBI or the 1978 House Select Committee on Assassinations. This "Mr. X" -- who resembles Rafael B. Cruz, Sr. -- remains an enigma. However, all those appearing in the photo at the trade mart, including Oswald's Cuban assistants, were identified by Chauncey Holt, the man on the far right, as being members of the CIA's Mongoose operation to overthrow Fidel Castro's government. On August 17, 1963, the day after the pamphleteering at the trade mart, Oswald appeared on an interview program at WDSU-AM radio called "Latin Listening Post" with host William Stuckey. On August 21, 1963, Oswald appeared with Stuckey and WDSU-TV's Bill Stuckey on an interview program, Conversation Carte Blanche, that also included Ed Butler, the Executive Vice-President of the Information Council of the Americas (INCA), headquartered in New Orleans and involved in distributing anti-communist educational materials throughout Latin America, and Carlos Bringuier, Cuban refugee and New Orleans Delegate of the Revolutionary Student Directorate (DRE), one of the more active of the anti-Castro refugee organizations. Bringuier had gotten into a physical altercation with Oswald on August 9, 1963, during a Fair Play for Cuba pamphleteering operation in downtown New Orleans. But Oswald and Bringuier actually worked in the same ground floor offices of the infamous Newman Building, where Guy Banister Associates was located 5312 Lafayette Street while Oswald's "pro-Castro" Fair Play for Cuba Committee was located around the corner but within the ground floor office, but with an address of 544 Camp Street. Between September 6 and 9, 1963, Oswald was seen in the company of Clay Shaw, according to New Orleans District Attorney Jim Garrison. Photo from WDSU-TV New Orleans footage of the August 16, 1963 pro-Castro demonstration in front of the International Trade Mart. Man in sun glasses at far right is Chauncey Holt, said to have been the accountant for mobster Meyer Lansky. Mr. X [the man in the white shirt and necktie to Oswald's left rear], according to an FBI New Orleans memo dated November 25, 1963, never handed out Fair Play for Cuba pamphlets but was merely holding them. The annotations on the identities of two of the men -- Bud Belcher and Leroy Young, both CIA agents involved with MONGOOSE -- came from Holt. Left-to-right: Comparison photographs of Rafael B. Cruz, Sr. taken sometime in the late 1950s; "Mr. X" seen with Oswald in New Orleans on August 16, 1963; and Cruz now. Oswald, earlier during the day of August 16, 1963, is said to have walked into the state employment office and offered to pay anyone who would help him hand out pamphlets during the noon lunch hour at the trade mart. One was Charles Hall Steele, Jr., who told the Warren Commission that Oswald paid him $2 to hand out pamphlets at the trade mart for 15 to 20 minutes. Steele, after dropping off his girlfriend, met Oswald and Mr. X on Canal Street. According to Steele's testimony, Mr. X was already with Oswald and would have likely been one of the Cuban MONGOOSE agents that was coordinating Oswald's pro-Castro street activities. The fact that the FBI memo states that Mr. X never handed out pamphlets, as did Oswald, indicates that the individual was serving as a coordinator of the activity at the trade mart. It is known that MONGOOSE involved CIA assets in Louisiana and Houston, Texas, places where Rafael B. Cruz, Sr. had resided. 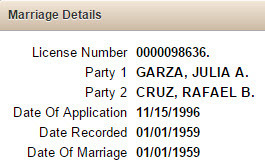 The height of Rafael Cruz, Sr. listed on his draft registration form from 1967 is also curious. He claimed he was 6 foot. In recent photographs of him standing next to his son, Ted, the elder Cruz is shorter than Ted, who is 5' 7". Individuals do grow shorter with age but not by six inches. The elder Cruz's Selective Service form does show signs of the height entry being altered. The 1967 form also lists Cruz's address as 2246 Carondelet Street in Apartment 2-B, not the French Street address listed in the phone directory listing Cruz along with his wife, who he was reported to have divorced prior to leaving Dallas. The draft registration form also lists Cruz's employer on July 26, 1967 as "Geophysics & Computer Service, Inc." This company is the French-based Compagnie Générale de Géophysique (CGG). The date July 26, 1967 is also significant for Cubans. Castro called his revolutionary popular front the "July 26 Movement." CGG is linked to the large Schlumberger oil conglomerate, which, along with Halliburton, is one of the two largest oilfield drilling companies in the world. Schlumberger had been active with the CIA and Zapata Offshore Company, which was owned by George H. W. Bush. Moreover, Jean de Menil, the son-in-law of Schlumberger founder Conrad Schlumberger, was a key figure in Permindex, the New Orleans-based CIA front headed up by Clay Shaw that was a key target of Garrison's investigation of the New Orleans connection to JFK's assassination in Dallas. The year 1967, when Rafael Cruz, Sr. departed New Orleans, allegedly with his second wife (and Ted Cruz's mother) Eleanor Darragh Wilson, was the same year that Garrison's official investigation of the New Orleans connection to Kennedy's assassination commenced with an indictment of Shaw, the same man whose office was located inside the International Trade Mart where Oswald and Mr. X were involved with handing out Fair Play for Cuba pamphlets on August 16, 1963. Ted Cruz's mother Eleanor also reportedly worked for the Schlumberger affiliate. When the Cruzes left for Calgary in 1967, they worked under the aegis of Rafael B. Cruz & Associates, Ltd., which was owned by Rafael B. Cruz, Sr.
Mystery also surrounds Ted Cruz's mother Eleanor. She was married to Texas native Alan Wilson and lived with him in London from 1960 to 1966. In 1965, their infant son Michael died from crib death. Alan Wilson, who still lives in London, told McClatchy News Service that Michael was not his son. In his autobiography, Senator Ted Cruz not only claims Michael was the son of his mother and Alan but also claims the baby died in 1965. In fact, Michael, according to London vital statistics records, died in 1966 and well after the Wilsons were divorced. Eleanor Cruz, who lives in Houston, has been mum on her marriage to Wilson and her marriage to Cruz, which lasted from 1969 to 1997. Rafael B. Cruz, Sr., a Canadian citizen, became a U.S. citizen in 2005. Ted Cruz did not renounce his Canadian citizenship until 2013. Enter a small London-based British firm called Strategic Communications Laboratories, Ltd. (SCL). Specializing in mass deception, psychological warfare, influence operations, and behavioral modification, the firm, thought to have ties with British intelligence and the CIA, has been in business since 1993. The firm's U.S. subsidiary, Cambridge Analytics, is now advising the Cruz for President campaign. SCL has proudly admitted that it has influenced elections in Ukraine, Romania, India, Kenya, Thailand, Latvia, Nigeria, and South Africa.